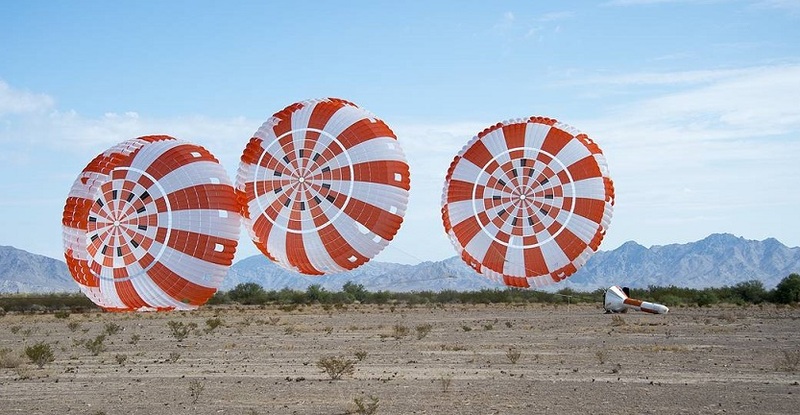 The parachute system for Orion, America’s spacecraft that will carry humans to deep space, deployed as planned after being dropped from an altitude of 6.6 miles on July 12, at the U.S. Army Proving Ground in Yuma, Arizona. Data from the successful seventh drop in a series of eight qualification tests will help NASA engineers certify Orion’s parachutes for missions with astronauts. To demonstrate the system’s robustness, this test evaluated parachute deployment under conditions that exceeded the requirements for a system carrying crew. Engineers dropped the dart-shaped test article from an altitude that allowed it to generate enough speed to simulate almost twice as much force on the main chutes as would be expected under normal conditions. Orion’s full parachute system includes 11 parachutes — three forward-bay cover parachutes, two drogue parachutes, three pilot parachutes, and three main parachutes that will reduce the capsule’s speed after reentry in support of a safe landing in the ocean.